BBC NEWS | UK | Wales | South East Wales | Life from Venus blown to Earth? Life from Venus blown to Earth? Life on Venus could be blown to Earth by powerful winds, scientists claim. Previous research has considered the possibility of micro organisms existing in Venus's atmosphere despite extreme temperatures on its surface. But two scientists at the Cardiff Centre for Astrobiology say microbes from Venus could actually be blown into the Earth's atmosphere by solar winds. Their findings follow analysis of data from the European Space Agency's Venus Express probe, launched in 2005. Prof Chandra Wickramasinghe and Dr Janaki Wickramasinghe claim Venus's clouds contain chemicals that are consistent with the presence of micro organisms. They suggest that under certain conditions, these microbes from high in Venus's atmosphere could be blown into the Earth's atmosphere. This process would only take days or weeks. But the Sun, Earth and Venus must be suitably aligned, which last happened in 2004 and will not happen again until 2012. Prof Wickramasinghe said: "Venus and Earth have often been referred to as sisters because of their geological similarities. "Our research proposes that the two sisters may be biologically interconnected as well." The work has been published online in a new paper in the Astrophysics and Space Science journal. But Prof Fred Taylor, a planetary scientist at Oxford University, said he was sceptical about the research. 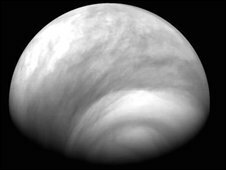 "The idea of life on Venus, particularly the clouds where the temperature and pressure are similar to the Earth, has been floated around for a while but is not really very likely," he said. 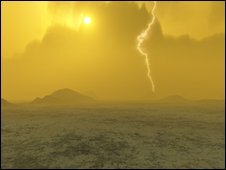 He added that it was "most unlikely" anyway that microbes from Venus could be transferred to the Earth's atmosphere by solar winds. The Venus Express probe, launched in November 2005, is orbiting the planet to study its atmosphere. Scientists hope to learn how Venus, which is similar to Earth in size, mass and composition, evolved so differently over the last 4.6 billion years. The mission was the first to be sent to the planet in 15 years.